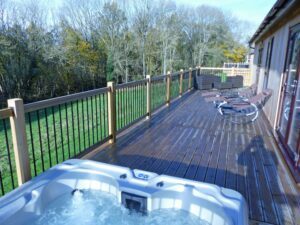 Hazel Lodge is a luxury contemporary cedar four person self catering holiday lodge with hot tub. 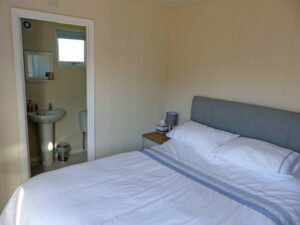 This accommodation set in rural Shropshire is in striking distance of many diverse first class attractions. Also see our two person Ash Lodge and four person Elm Lodge. Hazel Lodge. 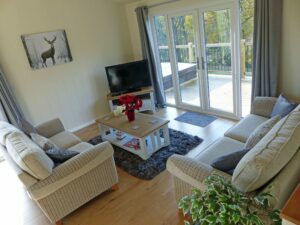 An immaculately presented two bedroom, four person self catering holiday lodge with hot tub that stand in extensive grounds amid the rural Shropshire countryside. Walking trails and cycle routes are directly accessible with golf courses, sailing, horse riding and fishing all available locally. The lodge, located midway between Bridgnorth and Bewdley is a great base from which to visit a wide variety of attractions including the Severn Valley Railway, the Wyre Forest National Nature Reserve, West Midlands Safari Park, the Shropshire hills and Ironbridge and its museums. The lodge provides views of woodlands and open farmland. Just the location to sit back and enjoy peace and seclusion. Situated on a large private parkland site with just 10 bespoke lodges. Perfect accommodation is provided for those who enjoy the outdoors and are looking for luxury at any time of the year. Hazel lodge benefits from a very generously proportioned south and west facing deck where full advantage of the sunshine can be enjoyed all day long. A variety of furniture is provided to meet all your outdoor needs from alfresco dining to relaxation. External lighting will enable you to continue to enjoy the outdoors even when the sun goes down. Extra towels are provided for your convenience when using the hot tub. Please go to our Availability/Book page to check availability and make a booking request. Also see our rates. The nearest pub which serves excellent home cooked food is 2.4 miles away and the nearest shops and convenience stores are 3 miles away at Highley. The nearest main supermarkets are located in Bridgnorth. If you want to let someone else do the cooking there are local Indian and Chinese takeaways who will deliver. Bridgnorth and Bewdley are approximately 15 minutes drive in opposite directions. A 10 minute drive will take you to the heart of the Wyre forest. Go to Out and About for more information. We are delighted to have been awarded the Tripadvisor Certificate of Excellence 2017 and now 2018, for both our lodges.